True barn find stories are becoming increasingly rarified, but there are still occasional garage find stories popping up that help fill in the gaps. One such garage find is this 1933 Plymouth Six Model PC that I came across at the Thunder in Omaha show in Omaha, Texas. Whenever I come across an automobile that really stands out, I start photographing the heck out of it from every angle imaginable. It’s just what I do. And this Plymouth, with its beautiful patina, really caught my eye. Especially that hood ornament. What a beautiful work of art. And it’s on an inexpensive-for-the-day Plymouth, no less. Great way to start a great conversation about a great garage find, that’s what I think. As we were talking, Bruce told me all kinds of background on the car. As it turns out, he wasn’t out searching for the next great find, but rather was out purchasing a late model Mopar from a private seller. Bruce is a Mopar guy. While taking delivery of his latest acquisition, the seller offered him a look at something he “might be interested in”. You really can’t hear that statement enough. So after digging through layers of boxes, bags, and other sundry items he finally got a glimpse at the ’33. There it was, in its present condition, just waiting for a new home. After getting the stuck garage door open, which took several hours, the Plymouth was on its way to its new home. What comes next is the best part, especially for automotive historians and the like. After researching the car for weeks to get the numbers and such, Bruce realized he had something really special on his hands: A low production, completely original Plymouth that had been owned by only two families in 82 years. So the original thought of hot-rodding the little coupe gave way to preserving it in its current state. And we can all thank Bruce for keeping this amazing time machine intact. True, the car would make a really cool hot rod, and to be sure, it’s been done on several models. A quick search on the internet will unearth several beautiful examples. But this particular car is far too perfect the way it is, so why mess with perfection? According to Bruce, the grandmother of the last family to own the vehicle was the actual “owner”, and she wouldn’t let anyone touch it. She liked it the way it was. Good for her. But by now you’ve noticed the name “Suzie” hand-painted on both doors. That came from the first family to own the car, and the information regarding that is gone to the ages. No one is quite sure if the original buyer painted that on to homage his spouse, girlfriend, offspring or something else. Maybe that’s what they called this particular Plymouth Six? Who knows, but that’s one of those details about this car that is so cool. A time machine with a mystery. Awesome. It has wooden wheels, which were a $45 option on a $495 car. They are called “Airwheels”, unique because they were 100-mph wooden wheels, a higher rating than the steel wheels on that model. 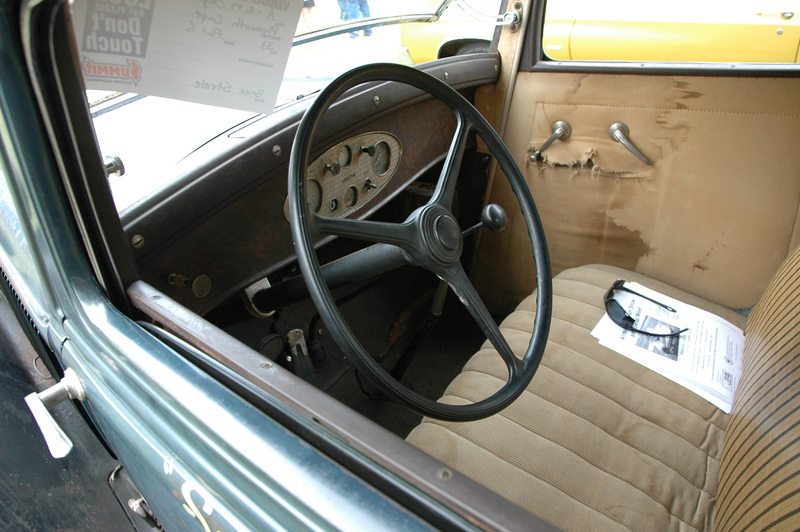 There are no fasteners of any kind holding the wheel assembly together. They have a compression fit and there are no bolts in either end of the spokes. 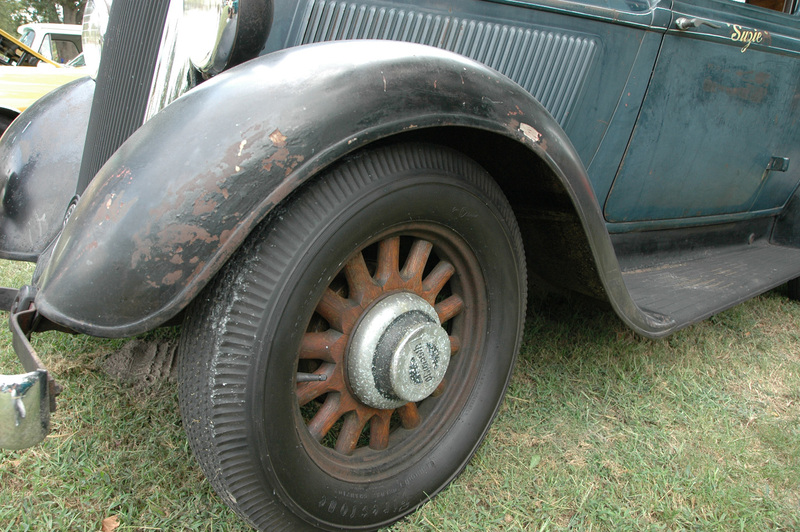 1933 was the last year the wooden wheels were offered. There were only 10, 853 Business Coupes produced. 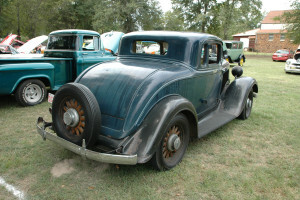 This was the first year of the six cylinder motor for Plymouth and was considered a very big deal in the automotive world. It was intended to help compete with the new Ford V8. Bruce’s model looks to have the optional aluminum “Red Head” flat six, which produced 76 horsepower. 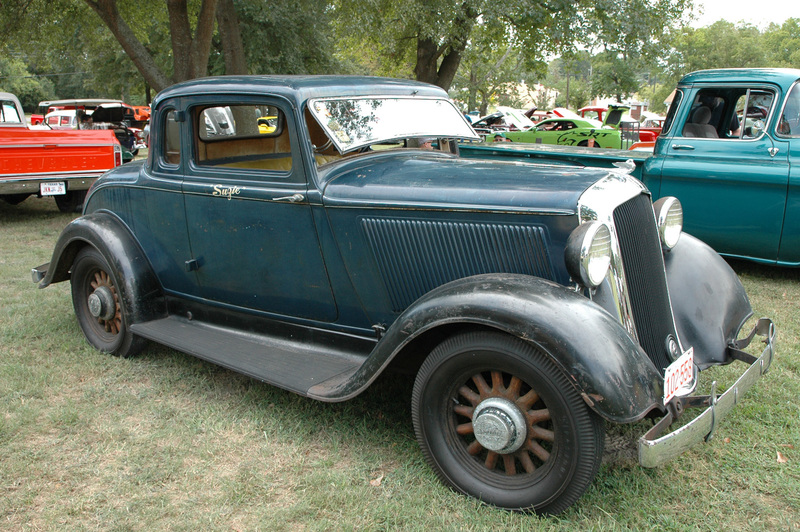 The 1933 Model 40 Ford V8 produced 75 horsepower. The new engine proved to be a very reliable and economical power plant. The basic six remained in production from its introduction in October 1932 until the end of 1959 model production. 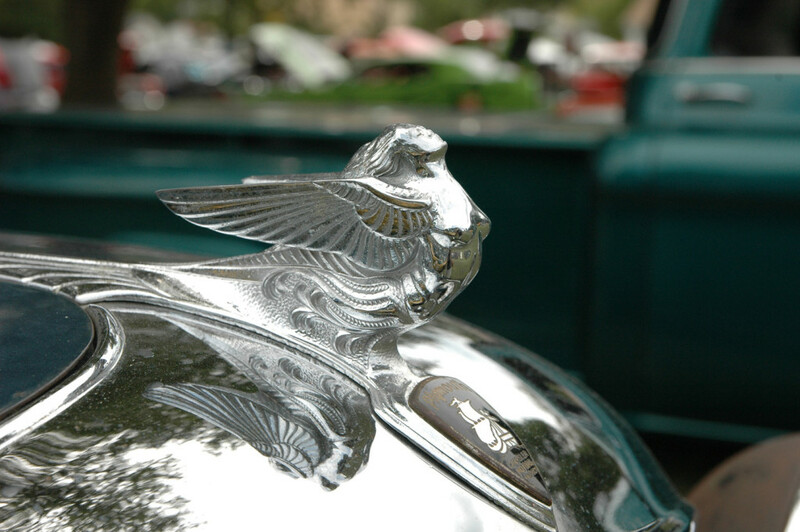 The radiator ornament is called the “Flying Lady” and was an upgrade option. The radiator cap is underneath the hood. Bruce’s car also has a vacuum operated clutch. If it’s engaged you don’t have to put your foot on the clutch pedal as the engine vacuum is used to move the pedal at just the right time and you only have to move the gearshift lever. It’s kind of like a “semi-automatic” for people who don’t want to use the clutch pedal. The fan belt is the original “Red” belt and still works perfectly. 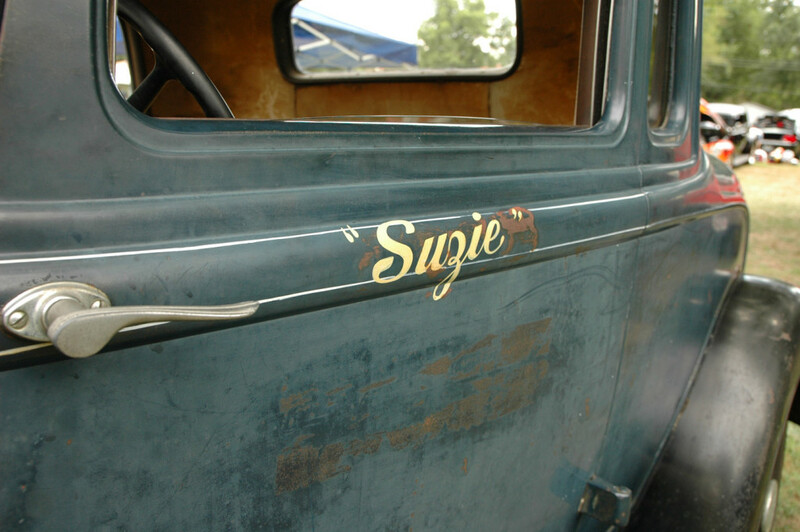 If you’re ever in the East Texas area at a car show, chances are you’ll come across “Suzie”. Bruce loves to show it and drives it regularly. I’m glad I got to see it and talk to him about it, as I love automotive history and it’s preservation. They are only original once and they don’t get any more original than this Plymouth. Thanks so much, Bruce. It was a pleasure meeting you and compiling information for this blog article.